Painting the exterior walls of your property will not only enhance its appearance but protect it from moisture, mould, corrosion and other issues caused by the severe weather conditions. Real Painters in North Kensington offer effective and reliable solutions for your exterior painting needs tailored to your personal taste and preferences. In order to prepare your exterior walls for the painting job, our experts will wash the dust and dirt and fill the cracks and holes. After the preparation work is complete, the technicians will carry out the required decorative work using the most appropriate paint for your façade. After the service is done, your house will be transformed into something you will be proud of. 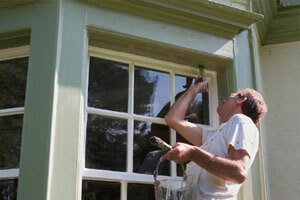 We work with highly qualified staff who will eliminate all the problems associated with your exterior painting. The technicians we deliver are fully equipped with the necessary tools and materials, including ladders, a scaffolding towel system, paint brushes, rollers, sanding blocks and other things that are required to complete your job easily and flawlessly. Forget about climbing ladders and cleaning up brushes! Book our exterior painting services in North Kensington and make this job an easy and simple experience. Our great staff is able to visit you from Monday to Friday (from 8 am to 7 pm). They will suggest the best painting solution for your unique property and give you a fair quote for the required job and materials.